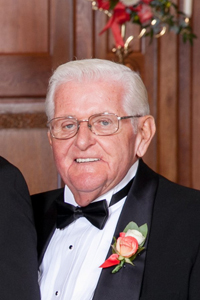 Leonard H. Anderson, 88, passed away on Sunday, September 9, 2018. A Celebration of Life will be held on Thursday, September 13, 2018 at 10:30 a.m. at the Washington Lutheran Church in Duncombe, IA. Visitation will be at the Foster Funeral and Cremation Center in Webster City on Wednesday, Sept. 12, 2018 from 5:00 p.m. to 8:00 p.m.
Leonard Hans Anderson was born April 9, 1930, on a farm southeast of Duncombe, Iowa, along with his twin brother Lawrence Henry Anderson. Their parents were Henry and Mathilda (Olson) Anderson. Leonard attended the country school, Washington #7, through the 8th grade. He attended and graduated from Lincoln High in 1947. He also attended Iowa State College for a short time. He married Joyce Luree Heatherington, from Otho, IA, on June 3, 1951, at St. Olaf Lutheran Church in Fort Dodge, IA. They established their home on a farm southeast of Duncombe where Leonard continued to farm with this dad and brother. To this marriage they were blessed with three daughters; Pam, Patsy, and Sonja. In his early years of farming, he raised cattle and enjoyed trips out west to buy them. While farming, he owned a semi-truck and grain trailer and also drove for other trucking companies in the area. For years he grew seed corn for DeKalb. In later years, he enjoyed farming with his son-in-law, Keith, until he retired in 2000. In 1980, Leonard and Joyce moved to Webster City where they have made their home until the present time. Leonard attained his real estate license in 1974 and worked for Webster City Realty until 1983 when he started his own business, Anderson Farm Realty. He was very active in farm sales and appraisals. He closed the office in 2005; however, he continued working as a consultant with Frye Farm Management in Webster City. He was President of the local Board of Realtors for two terms, President of the Iowa Farm and Land Brokers, Vice President of a six state area, and in 1988 was awarded the The Iowa Farm & Land Broker of the year. Leonard was an active, life-long member of Washington Lutheran Church in Duncombe where he was baptized, confirmed, and continued to grow his faith. He enjoyed singing in the choir and sang for many years as a soloist for various occasions. Leonard and Joyce loved to travel. Embracing his Norwegian heritage, he especially enjoyed a trip to Norway to see the Follinglo and Olson family farms and relatives. They also enjoyed annual trips to Acapulco, Mexico. Leonard enjoyed spending time with family and friends and will be greatly missed.